Office of the Dean, Institue of Science and Technology, Tribhuvan University published exam result of B. Math. Sc. Second Semester 2075. The exam was held by Tribhuvan University on 2075 Bhadra/Ashoj. Check B. Math. Sc. 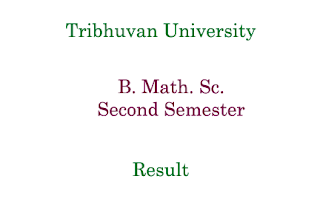 Second Semester Result Tribhuvan University below.